The Wrightsville Beach Biathlon enters its third year, taking place on March 23-24, 2012. New this year is a Team Relay component. This unique biathlon event is 8 miles Surf to Sound and combines flat-water stand-up paddleboarding (SUP) around Money Island for 4 miles followed by a 4 miles beach run. What a challenge! The race begins and ends at the Blockade Runner Resort on Waynick Blvd. in Wrightsville Beach. The SUP course starts out in the open channel near the Blockade Runner and follows a flat-water course around Money Island, leading back to the Blockade Runner. 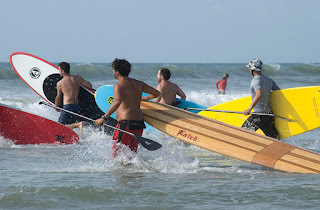 After completion of the paddleboarding part of the event, racers will begin the run, heading to the ocean beach from Access 33 and running to Johnny Mercer's Pier, to Crystal Pier, and back to the Blockade Runner. Relay Teams and Corporate Sponsorships are welcome! The Biathlon is a challenging, unique, and super-fun event. We are proud to have Wrightsville Beach host such a modern, scenic, and inspiring race. Learn more at events.blockade-runner.com/wrightsville-beach-biathlon.